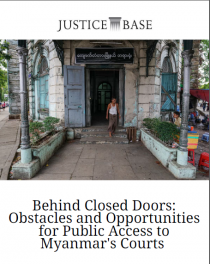 This June 2017 report from Justice Base details observers’ findings from 205 criminal and civil hearings in 36 of Yangon’s 50 courts. The report concludes that increasing public access to courts is a necessary condition for restoring public trust and a key to broader judicial system reform. 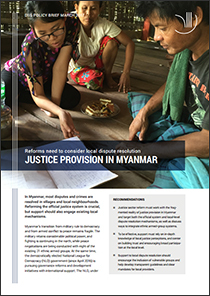 This October 2017 report from Justice Base details observers’ findings from Yangon Region’s Township and District Courts from 12 June 2013 to 30 April 2014 and 11 January 2015 to 28 December 2016. 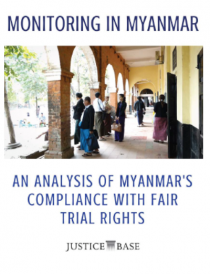 This March 2017 policy brief shares findings from recent research by the EverJust project, which is a collaboration between EMReF, Yangon University, the Danish Institute for International Studies, and Aarhus University. 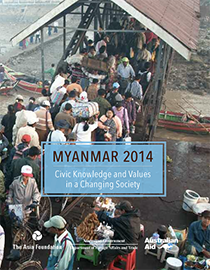 This 2014 survey report by The Asia Foundation (TAF) provides a broad sense of public knowledge and opinion across Myanmar from over 3,000 participants in all 14 States and Regions. The survey covers topics like knowledge of government, political participation and understanding, identity, gender, the peace process, public outlook, and sources of information.